Dr. Robert Viau, a professor of French at the University of New Brunswick, is receiving one of the highest civic orders bestowed by France for his outstanding contributions to education. In a special ceremony to be held Friday, March 24, Dr. Viau will be named a Knight of the Order of the Academic Palms. The award was established in 1808 by Emperor Napoléon Bonaparte to honour educators from universities and schools in France. The scope of the award was expanded in 1866 so it may also be awarded to foreigners and to French residents living abroad who contribute to and promote the French language and culture. Mme. Laurence Monmayrant, the Consul General of France in Moncton and Halifax, will present the honour to Dr. Viau at 2 p.m. Friday at the Alumni Lounge in the Alumni Memorial Building on UNB’s Fredericton campus. “Few Canadians have received the Order of Academic Palms and this is a rare honour,” says Dr. Viau. He is being recognized for his exemplary contributions to Francophone studies as a scholar and an educator. During his career, he has studied Québécois, Acadian, and Western Canadian French literature and published numerous books and articles. As an educator, he has dedicated himself to promoting the French language and to his students. He has also organized several educational trips to France, though the UNB Travel Study Program, which allowed his students to immerse themselves in French literature, art, and culture. All members of the UNB community and the public are invited to the ceremony and can RSVP with the department of French at french@unb.ca or 453-4651. 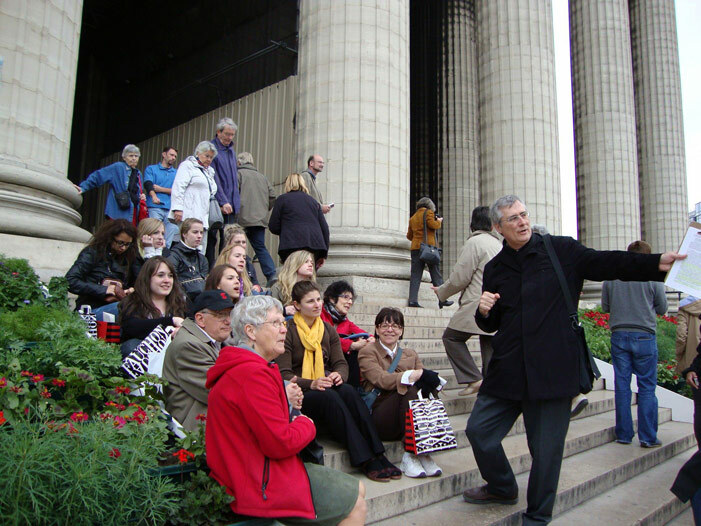 Photo: Dr. Robert Viau with his students in front of La Madeleine Church in Paris, France during a UNB Travel Study Program trip.